Doug and Stacy Cottom have welcomed Special Olympics into their bowling facility, Ross Cottom Lanes, for more than 25 years. They have allowed Special Olympics a place to compete for bowling competitions. The Cottoms have always been very welcoming when Special Olympics Illinois Southeastern/Area 14 comes in for its bowling competitions. They always immediately provide whatever is asked of them. They make absolutely sure that the Special Olympics athletes have a quality competition and a fabulous time. They have always kept games at a reasonable price for Special Olympics. They also provide plenty of volunteers during days of competition. A few years ago, shortly before the Area bowling competition, the Cottoms townhouse was hit by a tornado, destroying the townhouse and most of their belongings. The Cottoms were injured and lost most of their belongings. That didn’t stop them from continuing their service for the bowling competition. The Cottoms made sure that nothing interfered with the competition knowing how important it was for the athletes. In 2016, Ross Cottom Lanes once again welcomed Special Olympics as the Rend Lake Polar Plunge Pre-Registration Party was held in their lounge with no charge for the facility. The Cottoms have not just provided a facility, but have been great friends to the athletes and coaches of SOILL Southeastern/Area 14. Special Olympics Illinois is a not-for-profit organization offering year-round training and competition in 19 sports for more than 22,000 athletes with intellectual disabilities and more than 20,000 Young Athletes ages 2-7 with and without intellectual disabilities. Special Olympics transforms the lives of people with intellectual disabilities, allowing them to realize their full potential in sports and in life. Special Olympics programs enhance physical fitness, motor skills, self-confidence, social skills, and encourage family and community support. 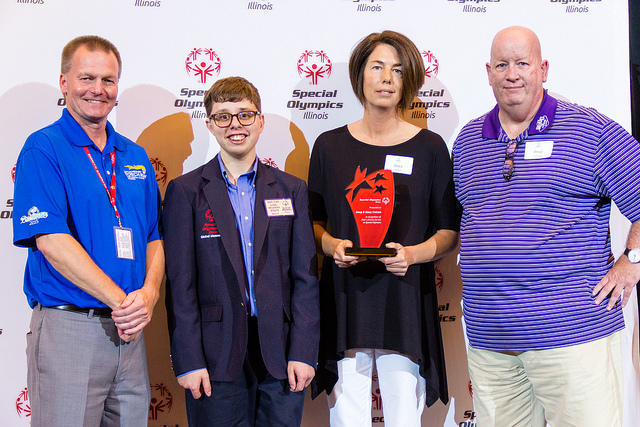 If you are interested in learning more about Special Olympics Illinois, volunteering or providing financial support to help make Special Olympics programs possible, contact your local Special Olympics agency, call 800-394-0562 or visit our website www.soill.org.